The main ingredients in beer are malt, water, yeast, and hops. But what exactly are they? Also, there is a fifth ingredient, adjuncts, which is in more beers than you’d imagine, so their importance can’t be overlooked. In this first of this series, we will look at malt, the basis for all beers, so important that it is both a verb and a noun. The simple definition of malt the noun is it is the grain that goes into beer, providing the sugars that the yeast converts to alcohol and CO2. 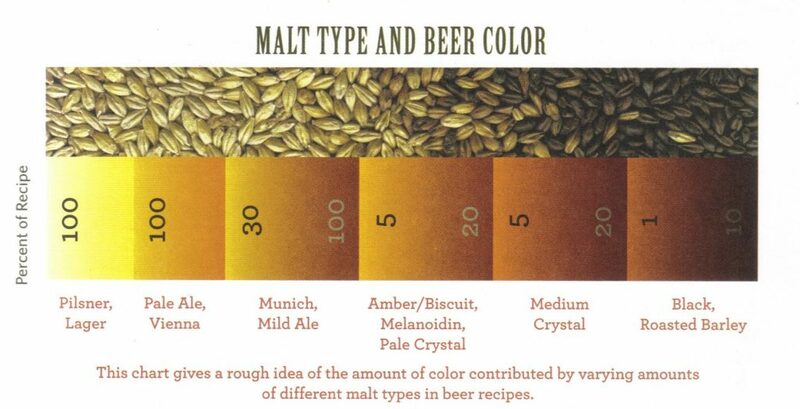 It contributes the beer’s sweetness and determines its colour. It is also responsible for the body of the beer, that amorphous word that is part density and viscosity, and part mouthfeel or texture of the beer. 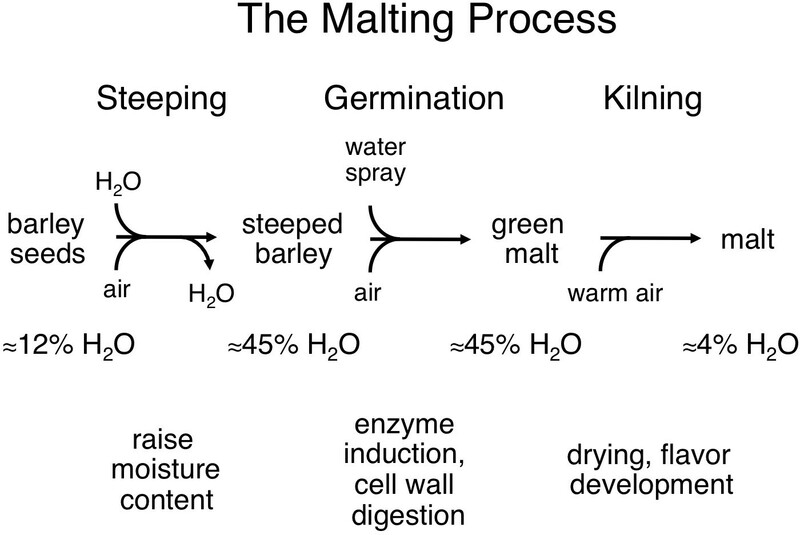 To Make Beer, You Must Malt Your Grains – What Is Malting? The verb “to malt, or malting, is the procedure that changes raw cereal grains to the germinated processed malt that is the necessary ingredient in not only in beer, but also whiskey, gin, vodka and all other grain spirits. In beer, barley is the most common grain used, but wheat, rye, oats, rice, sorghum and other cereals are also malted. 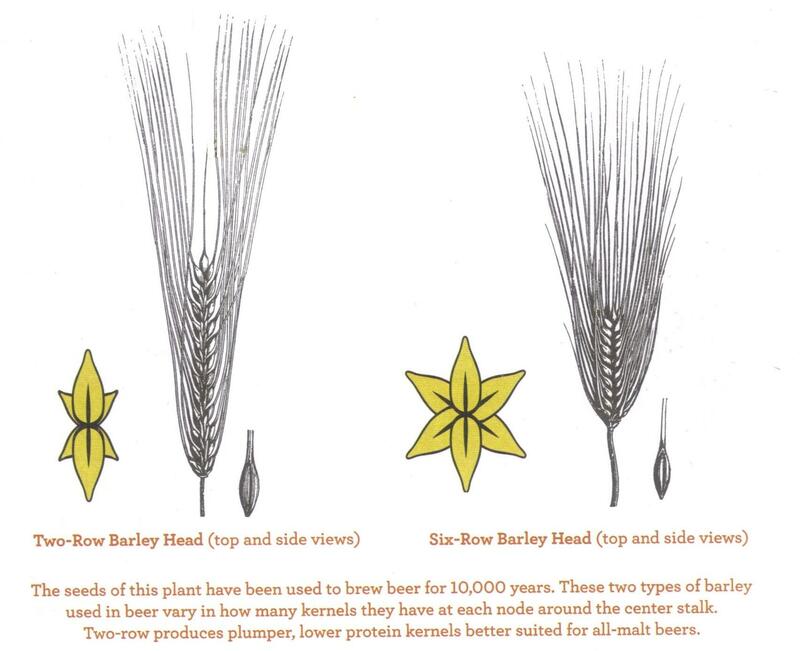 The two types of barley used are 2-row and 6-row, determined by the number of fertile flowers on the head able to produce kernels. While the 2-row variety has bigger kernels than 6-row, it has less protein, lower enzyme levels and husk content, making it the preferred barley for more flavourful or higher gravity beers such as those made by craft breweries. The 6-row variety has all its kernels fertile, so it gives more yield per acre. However, its higher diastatic power gives it more enzymes, which makes it more useful for lighter beers, or ones with a large amount of adjuncts, like the ubiquitous lagers which dominate almost every beer market in the world. For those of you living in Alberta, Canada, the province is home to some of the best beer barley in the world. This is not merely an opinion; thousands of breweries from all over the world get their malt from producers in Alberta. 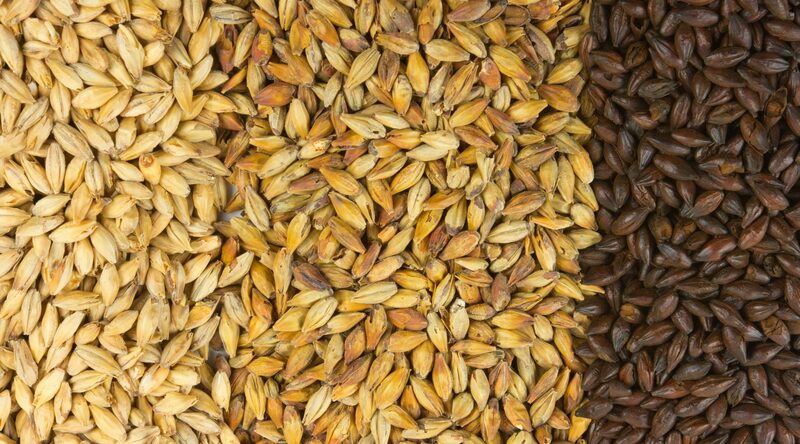 For a complete explanation of the Barley to Malt conversion process and the difference between Base and Specialty malts, check out this article in Just Beer. In order to get different coloured malt, kilning (roasting) the malt is required. The malts are cooked at different temperatures for a range of times. They are assigned various names, and these malts become the backbone of the different beer styles. Low kilned varieties such as Vienna, British and American Pale malts are cooked at around 55°C-80°C. Other malts are dried at lower temperatures (around 50°C-75°C), then raised to higher temperatures to roast. Czech (roasted at about 80°C), Dortmund (90°C-95°C) and Munich (100°C-120°C) malts are all examples of gradually darker colour malts. Chocolate or Black Patent malts get roasted at around 215°C-230°C to get that black colour that define porters and stouts. Because of their high temperature roasting, these types of malt have little enzyme activity so they cannot be used alone in a mash. Also, as little as 1-5% of the recipe’s grain bill need contain these malts in order to provide the necessary colour for dark beer. Historically, light coloured malts were dried by the sun, or in a warm room. The dark malts, however, needed to be cooked over a wood or coal fuelled fire.. The smokiness from the fire would transfer to the resulting beer. Finally, in 1817, Daniel Wheeler patented the drum roaster, and the malt became cleaner, aiding in the growth of the porters and stouts we know today. Currently, hot air is used to make the malt free of secondary flavours, but rauchmalt (smoke malt) has become a sought after ingredient needed to create smoked beer. Bamberg, Germany is still ground zero for this style, but craft breweries world-wide have caught on to this unique beer. Wheat is the second most popular malted grain, the essential ingredient in all wheat beers. In Germany, to be called a weizenbier (wheat beer), at least 50% of the grist must be wheat, a requirement that doesn’t exist in other countries. In addition, it is often used in small quantities in many beer styles to aid in head retention. Malted rye has become an increasing popular ingredient as exemplified by the growing number of rye beers available. Rye provides a sharp bitterness that cannot be replicated by hops. Typically, in Germany, 50-60% of the grain bill will be rye to be called a roggenbier (rye beer). Other popular malted grains are rice (especially in the Orient), oats and sorghum, which is commonly used in gluten-free beer. There is also another family of grains in beer recipes that do not go through the malting process, not surprisingly named the unmalted variety. Roasted barley is a classic in stouts, giving it its coffee flavour with less harshness than Black Patent malt. Unmalted wheat and rye will also show up in various beer styles, imparting different flavours than their malted versions do, so, the malt becomes the fundamental basis of beer. It provides the sugars needed to make alcohol, the colour and a wide range of flavours. Depending on malt variety, it can be subdued, providing very little flavour in light lagers, or it can give vanilla, toffee or caramel notes to amber ales. It also supplies the nutty flavour to brown beers, and the chocolate and coffee taste in dark beers. When a burnt toast bitterness is needed, malt can supply that, too. Next up: What is hops? The next part of this series, we will look at hops, the yin to malt’s yang. This little flower has become the favourite ingredient of today’s craft beer movement, so we will explain exactly what it is and why it has become so beloved.